PROTECTION UPON PROTECTION. 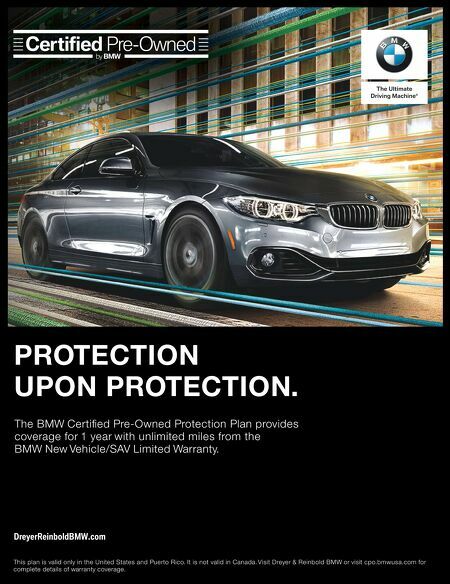 The BMW Certifi ed Pre-Owned Protection Plan provides coverage for 1 year with unlimited miles from the BMW New Vehicle/SAV Limited Warranty. This plan is valid only in the United States and Puerto Rico. It is not valid in Canada. Visit Dreyer & Reinbold BMW or visit cpo.bmwusa.com for complete details of warranty coverage.